You’re done thinking about it and have made a decision to start. You’re going to learn the piano and you couldn’t be happier about it. The difficult decision is which type of piano to get and after that, which brand? Then after that, which model? It can seem like a complicated test you have to pass to enter the piano world, but you need not feel confused any longer. The information in this blog post will make it crystal clear. 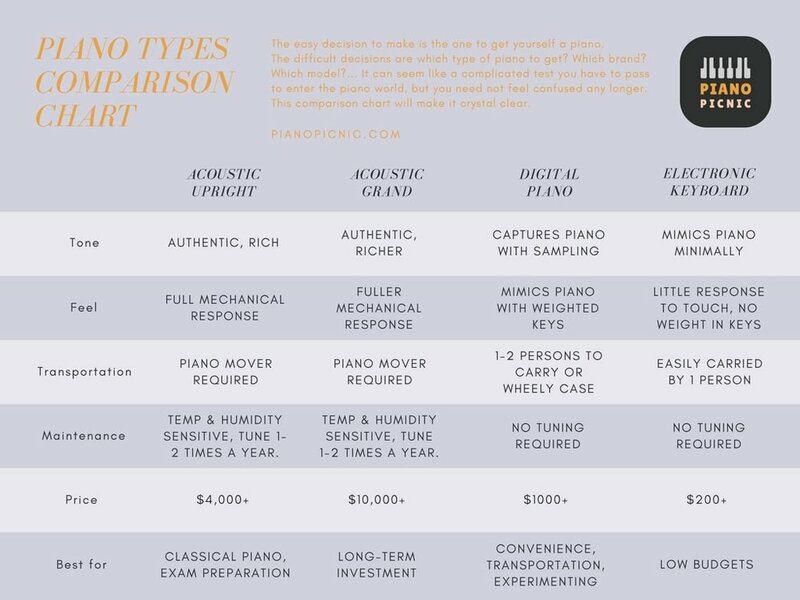 Read on to discover exactly what sort of piano will be best for you and download your FREE piano shopping complete guide! It’s tempting to want to go for a bargain piano and for some of us, the budget doesn’t leave much of an option. It is unnecessary for amateur pianists to own an expensive, upper-range professional piano. Much of the quality and richness of tone would be lost on the average person so simply isn’t worth remortgaging your home for! The best rule of thumb is to buy quality but within your budget. Give yourself the best chance of continuing with your piano learning and avoid the frustration that comes with an inferior instrument that doesn’t sound great, doesn’t respond to your touch dynamically and is likely difficult to play. Acoustic pianos: the best, biggest, heaviest and most expensive. Digital pianos: a mimicry of the acoustic in tone and feel, easier to transport, not as heavy, not so expensive. Electronic keyboards: the least realistic tone and feel, very easy to carry, extremely light, cheapest option. Let’s go into these categories in more depth to get an idea of what’s grand and not so grand about each option. Ready to go piano shopping? Enter your details below and I'll send you the COMPLETE KEYBOARD & PIANO SHOPPERS GUIDE for free! This shopping guide includes advice on keyboards, digital and acoustic pianos! The obvious thing about acoustic pianos is they are made of real materials. Encased in a wooden box the inner mechanisms are made of real wooden keys that trigger hammers lined with real felt which strike real metal strings causing them to vibrate and produce a sound. The sound is real with a richness in tone that none can simulate accurately. Additional to the richer sound, the feel of the keys and the way they respond to the lightness and heaviness of touch is specific to the real mechanics of the piano. The touch responsiveness of the acoustic piano allows the pianist to create the widest range of dynamics and articulation (short, dulled or emphasised notes). The acoustic is the ultimate goal for many but you don’t have to get there straight away–nor does a lack of one deem you a failure as a pianist! They are the most expensive option ranging from $4,000 at the lower end to grand pianos starting at $10,000! There are two types of acoustic pianos: the grand piano as mentioned above and the upright piano. The grand has a frame with strings that extend out horizontally from the keys makes the body of the piano longer and has a richer tone as a result. The upright piano has strings that run vertically. It’s more compact than the grand and can more easily fit in the average home. Don’t assume though that the acoustic is always inferior to the grand: the quality of the materials and the craftsmanship also affect the tone for good or for bad. Because of the real parts, acoustic pianos generally require more maintenance than their digital counterparts. The piano needs to be tuned 1-2 times a year and the wood, felt and steel all need to be conditioned in later years. Acoustic pianos comes with three pedals: soft, sostenuto and sustain. The more frequently used is the sustain pedal. Digital pianos usually have only a sustain pedal, sold separately, but for most amateur pianists a sustain pedal alone is all that’s needed. Though it is impossible to fully simulate the tone and feel of the acoustic piano, many digital pianos in recent years have come unbelievably close. Highly skilled audio engineers undertake an intricate process to record each note of top-of-the-line pianos. The recording is then used as a sample that is triggered once the digital piano key is pressed. The layman may not recognise the difference between high-end digital piano sounds and the real deal, but there are always those with a trained ear that can. But what the digital piano lacks in authenticity it makes up for with convenience and versatility. Digital pianos have the advantage of sending an electronic signal rather than producing a sound on impact. This means that the signal can be directed to headphones for seemingly silent practice that doesn’t disturb the household; to a computer for recording or manipulating with software; to a sound desk or amplifier to project a clean piano sound to an audience; or to a personal device or tablet to use with music-technology apps. Due to the complex electronics onboard digital pianos still tend to be relatively heavy. They can be easily carried between two people, or by one person within a hard case with wheels. That’s much easier than an acoustic piano which requires a team of very strong people and a truck! The other advantage with the digital piano is that it doesn’t need to be tuned every time you move it. Provided it’s moved with care, you simply set it on a stand, plug it in and you are ready to play. Digital pianos can come either in a cabinet-style frame or as a cheaper option you can opt to get the instrument on it’s own to set on a heavy-duty keyboard stand (purchased separately). Digital pianos in cabinet-style will sometimes come with three pedals though most commonly only the sustain pedal is provided. Without the frame you may need to purchase a sustain pedal separately, or SECRET TIP: ask them to throw it in for free with your piano purchase! Yamaha, Kurzweil, Nord, Roland, Korg. The most affordable way to get started, electronic keyboards are less than ideal for pursuing piano training as they usually have less keys than the full piano (61 or less rather than 88) which limits the kinds of pieces you are able to play. Because electronic keyboards are made to cater to a wide range of synth, organ and instrument sounds it is less piano-centric, so the piano sound is typically of less quality. Keyboards are made with non-weighted keys. This makes it easier to play melodic passages quickly, but means there is little to no spring-back on the keys and only a slight ability to respond to dynamic changes. Without weighted keys, a student will not develop the hand strength required to play difficult piano pieces. So while the keyboard is cheaper and easier to get a hold of when starting out, it should be seen as a temporary measure if you want to progress in your technique. Because of the lack of weighted keys, keyboards are very lightweight! Easy to travel with and great to have if you are plugging into a midi-interface and software to record or explore more sounds. If a digital piano is not within your budget, try finding a keyboard with the most keys that you can afford, ie 61 or 76 keys are the best options as they’re the closest to the full 88 key-range. Yamaha PSR series: the 76-key, or 61 key. Casio CTK series: 61 key. Regardless of what kind of piano you go for, you’ll need to get a piano bench. This should have adjustable height so that you can be seated at the correct height with the piano keys. When starting out, some people use a chair or stool and pile cushions to get the desired height – this should work for a few weeks until you can find a proper stool, but is not a long-term solution. If you’ve opted for the non-acoustic varieties, you will need a keyboard stand for your digital piano or electronic keyboard. SECRET TIP: I recommend the Z frame styles as opposed to the X stands simply because they don’t bang at your knees when you pull your seat forward! They also look pretty cool! Another must-buy if you’ve gone the digital/electronic route is headphones! If you’ve invested in a quality model digital piano you really should invest in a quality pair of headphones so that you can better hear the richness of your beautifully sampled piano tone. Audio-Techica, Beyerdynamic, Sennheiser, AKG, Sony. What I’m rocking: Sennheiser HD280PROs. If you want to play classical music than you will be better suited with an acoustic piano. If you are more into pop, rock, funk, blues or jazz (or anything else really!) than a digital piano with all it’s features and capabilities will suit you well. If you wish to play in order to produce electronic or synth heavy music than a keyboard with it’s midi-control capability may be better. Do you mostly practice at night and live with other people? Headphones will be handy for you my friend, so go for a digital piano or keyboard. Still struggling to relate all this information to your situation? Here are three common types of people and situations. Read through these examples and think about which situation might apply to you. Teen who loves pop songs and wants to learn to play favourite songs on piano and eventually join a band. Great to learn on as a complete beginner. Functionality with software & apps for recording & exploring. Good piano sound but also has other instruments to explore. Headphone capability to avoid disturbing family members or flatmates. Busy mother wants to learn to play serious classical piano pieces, sit graded exams and teach her children one day. Long-term investment (will retain value well). If practicing early evenings or weekends then you don’t need to worry about disturbing others and you’ll want the children to grow up listening to the sound of the piano through the house. The main examination boards don’t allow you to sit your exam on a digital piano, so practising on the acoustic is best. Young professional wanting to pick up a new hobby, works till late and has other evening activities. Recommended: Keyboard or Digital Piano. Depending on budget, an electronic option is best when you may be playing late at night or early in the morning since you can use headphones to limit disturbance to others. Lower cost - smaller investment needed and so a good starting point for those who are unsure of how long they will keep the passion going. Easy to sell on and upgrade if you decide to stick with it. Retiree returning to lessons after hiatus with more time to play and savings to invest in a good piano. If the budget a problem it’s best to go with the acoustic. It’s suitable for those who may play during the day and those who have a passion for the true and rich piano sound that only the acoustic can deliver. No electronics or technical things to worry about, you only need to get a piano mover (or Grandchildren!) to get it into your home and leave it there with a visit from the technician to tune it every 6-12 months. The above examples are based on common types of people that I have known throughout my journey as a pianist. You may not fit strictly into any of these types but you can usually identify with some of the aspects mentioned. Take these into consideration and decide what’s best for you. When you have decided what type of piano you need to buy it’s time to go into your nearest piano dealer. Don’t worry, you don’t actually have to buy brand new! Simply invest some time playing the different brands and models and ask the sales people lots of questions. As you spend time testing out the various models you will begin to notice the difference in tone between each brand. Once you’ve found your preferred brand, get the best model you can afford in that range. It will be a long-term investment for as long as you look after it.